All this while he attempts to prop up a fading coal industry that is responsible for killing 24 times as many birds as wind energy. 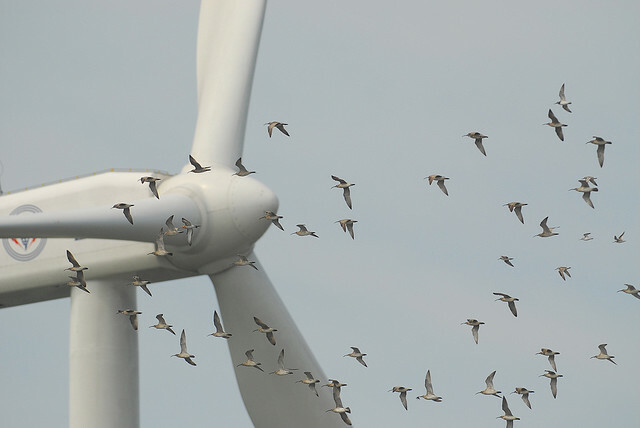 But do wind turbines really “kill so many birds?” It’s one of the most commonly repeated criticisms of wind power: that they are giant Cuisinarts for birds. Last winter, Trump’s secretary of the interior, Ryan Zinke, told an oil and gas industry audience that wind facilities kill 750,000 birds a year. Yet his own Fish & Wildlife Service put the estimate at less than half that number. Meanwhile, Zinke is doing away with century-old protections under the Migratory Bird Treaty Act. Estimated bird deaths from wind turbines are small when compared to other human-caused sources of avian mortality. In contrast to the 5 billion birds killed annually as a result of encounters with a variety of hazards ranging from domestic cats to building glass, turbines are a much smaller risk. The greatest threat to birds today is climate change. Of Massachusetts’ 143 breeding bird species evaluated by Mass Audubon, 43 percent are “highly vulnerable” to its impacts. Climate change produces warmer temperatures that alter the length of seasons, interrupting traditional migration patterns. It also causes accelerated sea-level rise and stronger ocean storms, which wreak havoc on coastal bird habitats, drowning out the nesting and foraging areas for species such as the federally protected roseate tern and piping plover. The impacts of climate change on birds will become even more severe unless we reduce our over-dependence on fossil fuels, which are clogging the atmosphere and heating up the planet. We can do this by increasing conservation and efficiency, and producing more renewable energy. Wind energy is now among the most cost-effective, competitive, and reliable technologies available. Today, the U.S. wind energy industry is primarily comprised of land-based turbines. As the third-most densely populated state, Massachusetts isn’t a very hospitable place for big, terrestrial wind-energy development — we’re just too crowded. So, we look offshore where there’s more space, fewer people, and stronger winds. Europe can boast a 24-year history of successful offshore wind-energy development, with more than 4,000 turbines in the water. In comparison, the United States has just five operating structures, planted in the seabed off Block Island, R.I.
Bay State voters support offshore wind, as a WBUR/MassINC September poll showed, with an overwhelming 80 percent of those tallied saying we should rely more on wind for our electricity. Consistent with this opinion, Beacon Hill lawmakers recently passed legislation that will hopefully result in at least 3,200 megawatts of offshore wind energy, as we work to reduce our reliance on dirty fossil fuels and reduce greenhouse-gas emissions. In response, the Vineyard Wind company aims to build the first U.S. industrial-scale wind farm 35 miles south of Cape Cod. Its 80-100 turbines would remove 2 million tons annually of heat-trapping carbon dioxide, in addition to thousands of tons of poisonous nitrogen and sulfur oxides. That’s good for people, birds, and wildlife. For this wind facility to be viable, however, it must first demonstrate that it will pose no significant threat to the marine life and environment in and around the project area. That doesn’t mean the wind facility can have absolutely no affect on the region’s wildlife and habitat, as any development of energy will entail some level of impact. However, the project must be designed to avoid any significant environmental damage, and anticipated impacts need to be minimized and mitigated. That’s the sequence to success and the review standard for this project and those in the future. If Vineyard Wind gets it right, others will follow as leases in two more deep-water areas off Massachusetts and Rhode Island have been granted, with a fourth sale scheduled next month. And while Mass Audubon supports the deployment of renewable wind-energy projects off our shores, that commitment can’t and will not be at any cost. With appropriate design, siting, and mitigation, the industry can grow and prosper as Massachusetts does its part to combat the devastating impacts of global climate change. Birds, other wildlife, and people will all reap the benefits.